Aurum Cables High Performance Cat6a Cable provides superior transmission with extremely low signal losses. 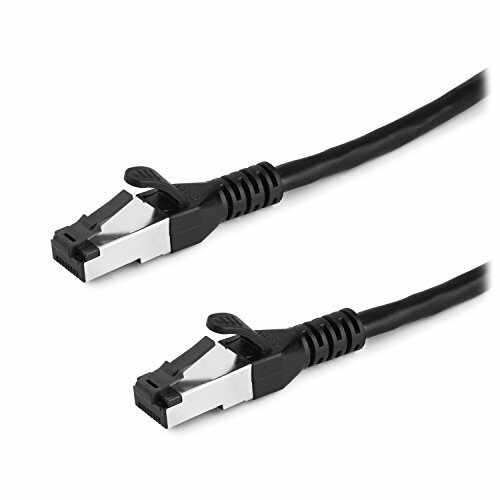 Cat6a Snagless Network Patch Cables will support up to 550 MHz and guarantees high-speed data transfer for server applications, cloud computing, video surveillance, and online high-definition video streaming. The Cat6a highly rated cable is suitable for Fast Ethernet, Gigabit Ethernet, and 10-Gigabit Ethernet. Delivers universal connectivity to computers and network components, such as routers, switch boxes, network printers, network attached storage (NAS) devices, VoIP phones, and PoE devices. Aurum Cables Cat6a Ethernet Patch Cable is made with shielded connectors with gold-plated contacts, durable PVC jacket and molded strain-relief boots, and snagless molds resist corrosion, provide durability, and ensure a secure connection. Bare copper conductors enhance cable performance and comply with UL 444 specifications for communications cables. Flexible and durable Cat6a cable with high bandwidth of up to 550 MHz.